Grover Cleveland (1837 – 1908). Twenty-second and Twenty-fourth President of the United States. Document Signed. October 25, 1887. 2 pages. 8 1/8” x 13”. 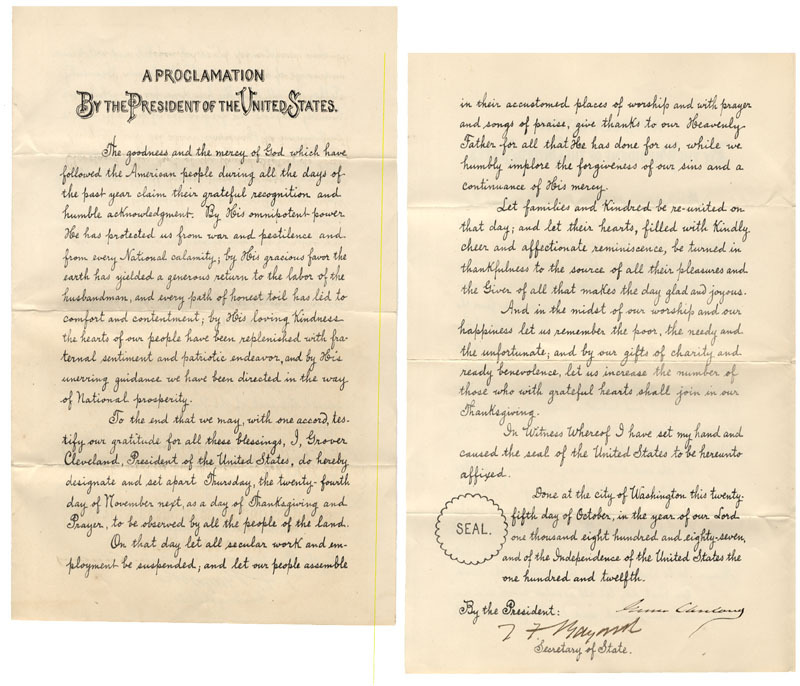 Printed proclamation recognizing and declaring Thanksgiving Day for “Thursday the twenty-fourth day of November next, as a day of Thanksgiving and Prayer…” Boldy Signed by Cleveland at the conclusion. Countersigned by Thomas F. Bayard as Secretary of State. A complete transcription follows below. By the President of the United States: The goodness and the mercy of God, which have followed the American people during all the days of the past year claim our grateful recognition and humble acknowledgment. By His omnipotent power He has protected us from war and pestilence and from every national calamity; by His gracious favor the earth has yielded a generous return to the labor of the husbandman, and every path of honest toil has led to comfort and contentment; by His loving kindness the hearts of our people have been replenished with fraternal sentiment and patriotic endeavor, and by His Fatherly guidance we have been directed in the way of national prosperity. To the end that we may with one accord testify our gratitude for all these blessings, I, Grover Cleveland, President of the United States, do hereby designate and set apart Thursday, the twenty-fourth day of November next as a day of Thanksgiving and Prayer, to be observed by all the people of the land. On the day let all secular work and employment be suspended; and let our people assemble in their accustomed places of worship and with prayer and songs of praise, give thanks to our Heavenly Father for all that He has done for us while we implore the forgiveness of our sins and a continuance of His mercy. Let families and kindred be reunited on that day and let their hearts, filled with kindly cheer and affectionate reminiscence, be turned to the source of all their pleasures and to the Giver of all that makes the day bright and joyous. And in the midst of our worship and enjoyments let us remember the poor, the needy, and the unfortunate; and by our gifts of charity and ready benevolence let us increase the number of those who with grateful hearts shall join in our Thanksgiving. In witness whereof I have set my hand and caused the seal of the United States to be hereunto affixed. Done at the city of Washington, this twenty-fifth day of October in the year of our Lord one thousand eight hundred and eighty-seven, and of the Independence of the United States the one hundred and twelfth.